Simba Information is a leading source for market data, trends, and analysis in the publishing and media industries, including trade book publishing, pre-K–12 and higher education publishing, legal & business publishing, scientific/technical & medical publishing, yellow pages publishing, and corporate training. 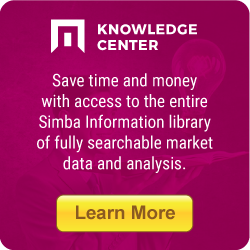 Journalists from the New York Times, Wall Street Journal, Washington Post, Boston Globe, NPR, CNBC, and other leading news sources frequently cite Simba Information in their articles and broadcasts. If you're looking for market information or data for editorial purposes, please contact us.